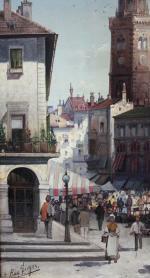 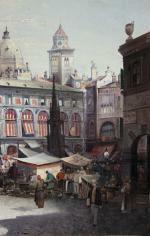 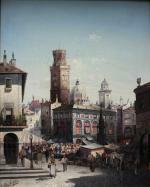 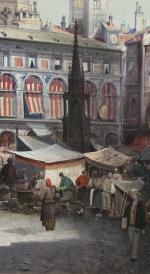 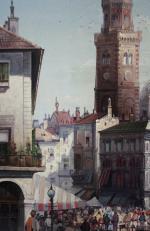 Street market scene in Bologna ( due to the old inscription on the painting’s back) was executed in th late 19th century by famous German architecture painter August Siegen (born 1850). 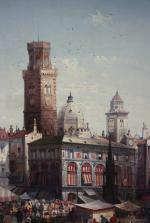 He was active in Munich and Vienna, travelled around Europe and Orient and recieved acknowledge with his detailled architecture views of European and Oriental old cities (Venice, Rome, Cairo, Hamburg, Rotterdam, Amsterdam and others). 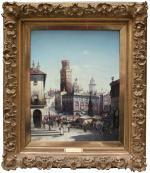 Inscription: signed lower right, on the back of panel - old inscription with title „Bologna“. 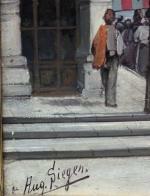 Technique: oil on wood panel. 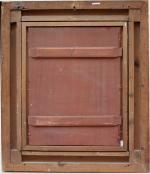 Original period gold-plated wood frame.